I‘m not going to pretend that November’s garden looks as good as October’s. I’m not even going to pretend that mid-November’s garden looks as good as early November’s. Look how vivid the Japanese blood grass and Siberian iris foliage look on November 5th. The same garden on November 14th, nine frosts and freezes later. But I do want to celebrate the mild November we’ve been having. Yes, mild. Here in Cold Climate Land, it has actually been unseasonably warm. In fact, the National Weather Service says that “the average temperature so far this month is higher than the October average temperature. This is when temperatures should be falling about 10 degrees[Fahrenheit] from last month.” The lawn is still green because the ground hasn’t frozen yet. And you can still find beauty if you know where to look. 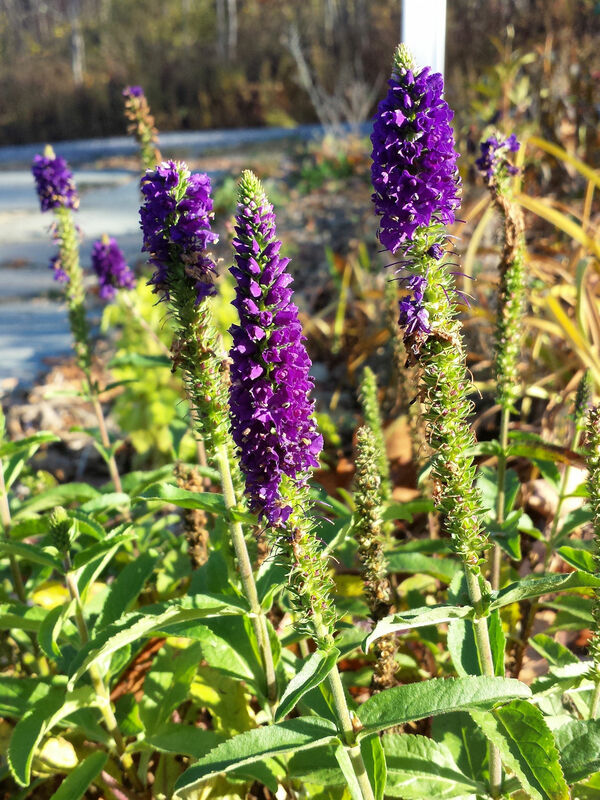 Magic Show® ‘Enchanted Indigo’ Veronica has been blooming since May, and still looks great even with temps in the low 20s at night. Kudos to ‘Enchanted Indigo’ spike speedwell, which I received as a sample from Proven Winners. 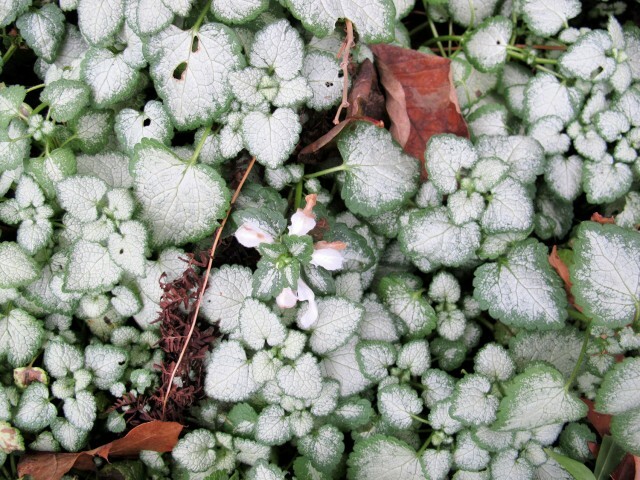 Many perennials can take a frost and keep blooming. Some can take a freeze in stride. 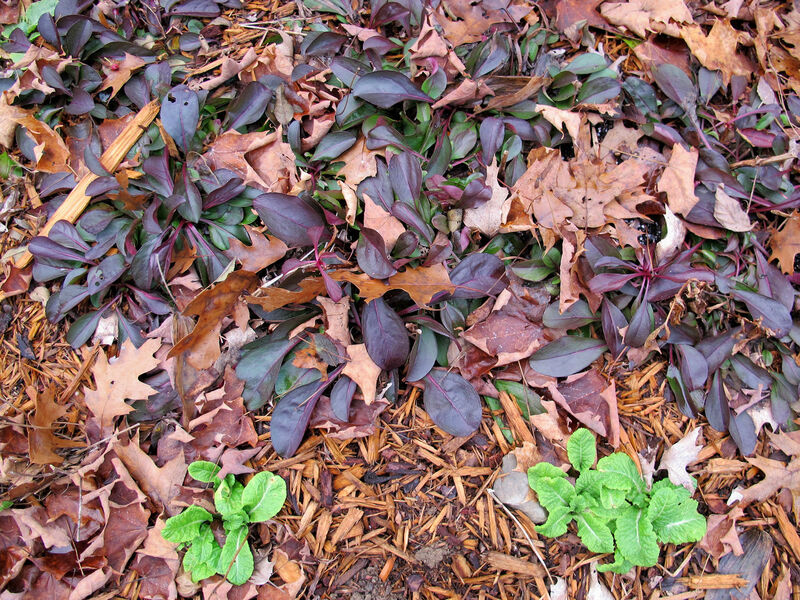 But after several freezes, even if the leaves look good, most plants stops producing flowers. But this veronica has not quit. 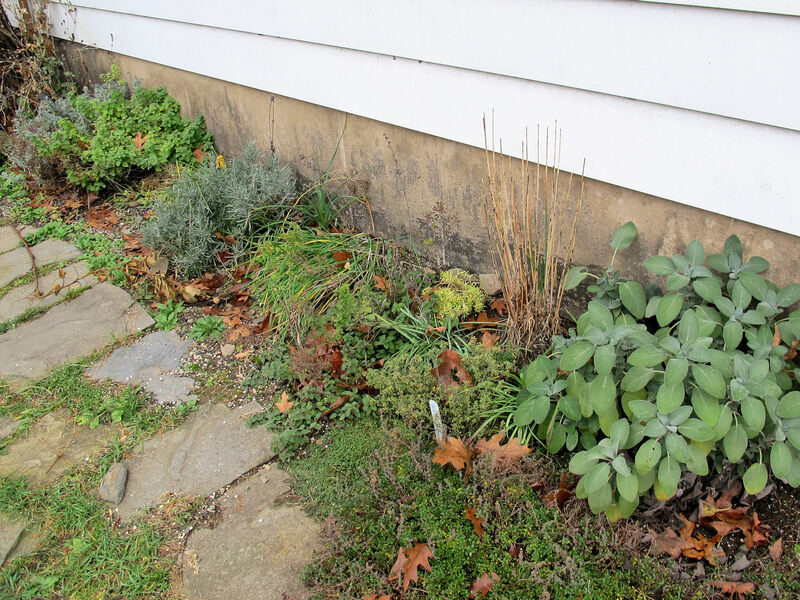 If you live in a cold climate, this plant should definitely be in your garden. Most veronicas perform well in my climate, but none other has bloomed so long. Last to bloom in fall, first to bloom in spring. 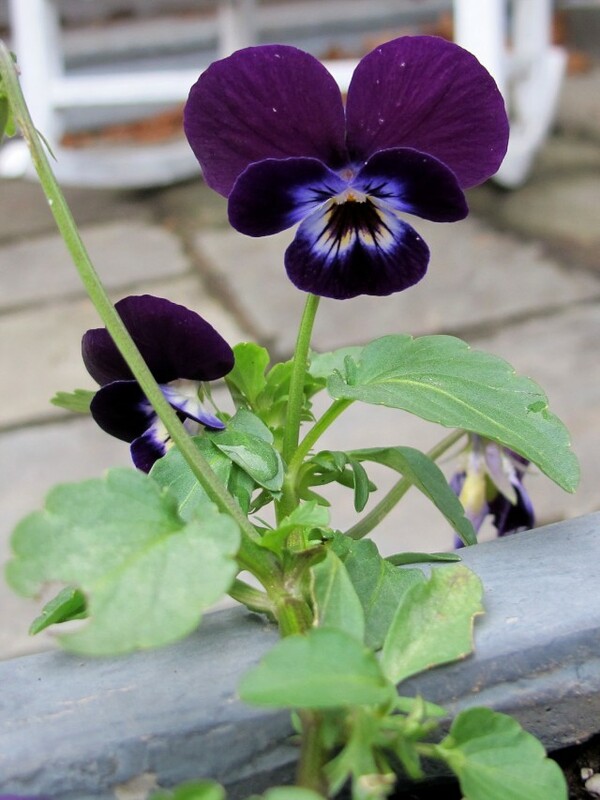 The humble but stalwart viola. Violas encompass Johnny-jump-ups and pansies. They are considered winter-blooming annuals down south, so it should not surprise anyone that they bloom until covered with snow here. The foliage is most striking on the lamiums, but they, too, are still putting out a few flowers. I brought this white blooming lamium from my old house, a passalong from my friend Bub, but there was a pink-blooming one already growing here, and it’s still blooming, too. And that’s it for flowers. Once again, foliage saves the day. If the pleasant part of autumn could be counted on to last longer, I would put more effort into combining these long-lasting foliage plants into attractive displays. It doesn’t seem worth the effort when bitter weather will keep potential viewers indoors, or snow will bury the carefully crafted color combinations. Instead, they are scattered around the garden, and on mild days I go look for them. 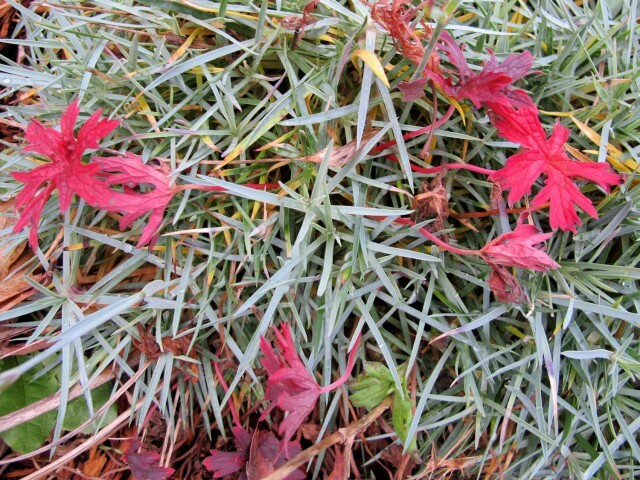 I love the contrast between the Geranium pratense leaves and the icy-blue dianthus foliage. And I love the way the bright green primrose foliage pops against the rosettes of ‘Dark Towers’ penstemon. I have clumps of golden feverfew in several beds. They always catch my eye–even from a distance. I sometimes wonder if I should group several clumps together for a massed display, but I fear the color might be too intense that way. The Mediterranean herbs, growing in a protected spot, still look pretty good. Heh. But they think the autumn they’ve already experienced is as cold as it gets. Are they in for a surprise! 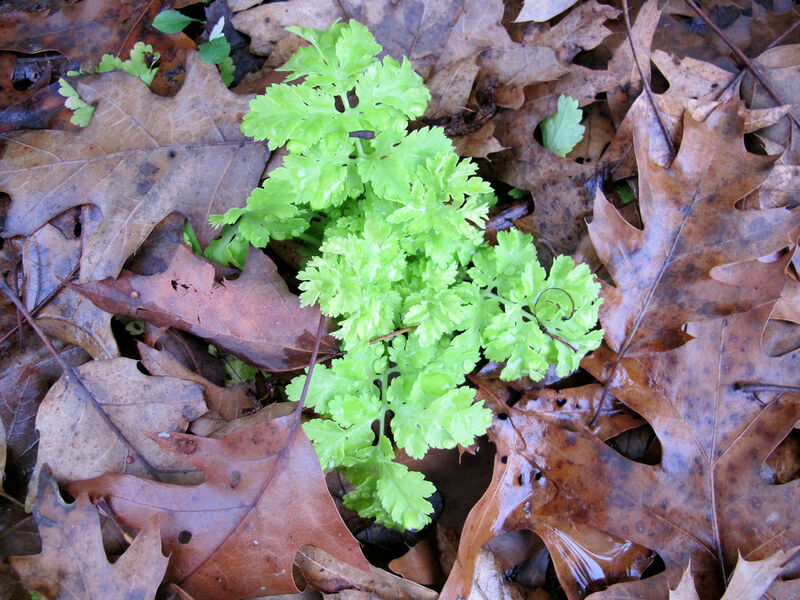 Foxgloves, coral bells, lungworts, hellebores, and other hardy geraniums still have presentable foliage, but I have featured them in many other cold season blog posts, so I won’t mention them here. You might also be interested in these previous November posts. Very nice web site. Much of my lamiums are just showing up…go figure. Amazing how we can still find color in our gardens. I loved the great pics. Thumbs up to those lovely late bloomers. Thanks for sharing! wonderful garden, and plants, I look lots of love into this area. I loved traveling through your post’s photos, with the colors that can still be found this late into the season. We’ve enjoyed the mild weather here as well. The last couple of days have been cold enough to freeze even the first inch or two of soil so, I assume things are about done now. We’ve been spoiled, it’s sad to see it all go. Speedwell is such a wonderful plant in the garden. It’s a pollinator magnet, along with being a really long bloomer and sporting really fun texture and color. An absolute necessity! And there are many cultivars that sport lots of color and size options. Yes, the Veronica genus is quite varied. I even like Germander speedwell, which is considered a weed. My February daphne thinks it’s spring here in the Southern Tier of NYS— snow, sleet, cold notwithstanding! My February daphne had nice, fat buds, but no blooms. I’m glad you have one, they are wonderful plants. I like to read your gardening tips. Its so informative for gardener. “Please share more information and ideas”. 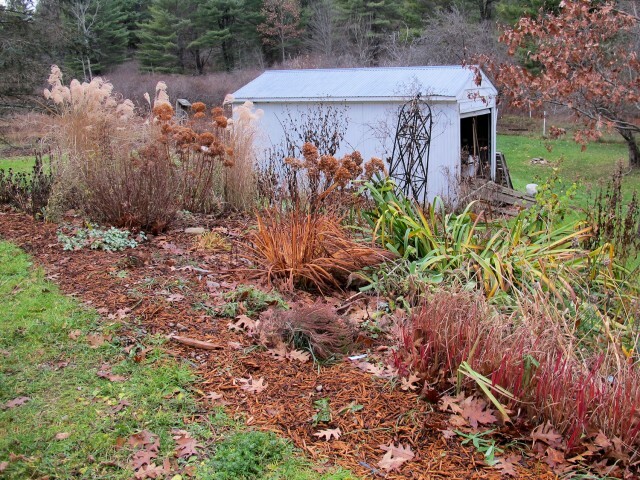 Yes November can be brown, bedraggled and down right dismal in the garden, but I love that worn look…there seems to be a beauty especially in those brave blooms and amazing foliage…you have some great foliage indeed. I only have a little pink in my garden, but I am going to get some of that Enchanted indigo from Proven Winners. Looks like a winner to me! Yes, an exceptional autumn in all ways. 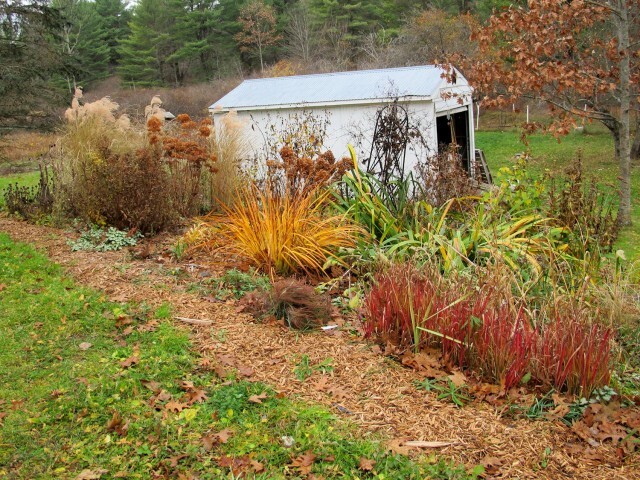 I’m from Connecticut and we still have lots of color…spireas, bradford pears and firebush as well as the beautiful drying hydrangea and miscanthus. Crab apples look like Christmas ornaments and the seedheads of sedum make their own contribution to this lovely season. Thank you for sharing…it made me go out there and explore. Matt, you are right, the lamium is striking. 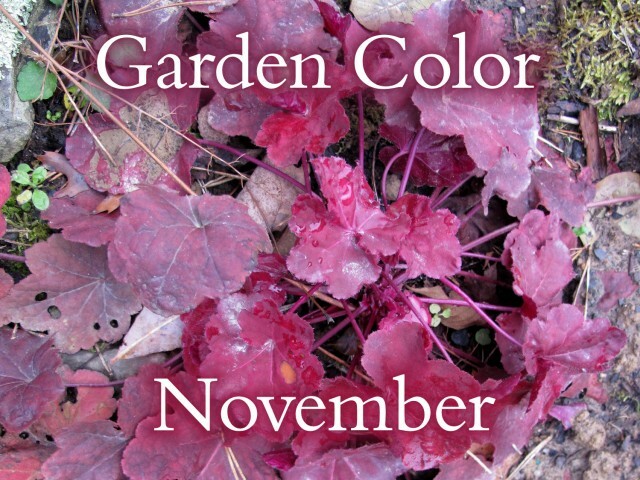 This November has been fairly mild for us as well; I really enjoyed the beautiful colors in the photos you shared. It has been a very nice Autumn. Here in the Pocono Mtns. we did have a bit of light snow in mid-October, but it was gone the next day. Weather forecasters are predicting a milder winter for the coming year. I sure do hope so. Mild November? You betcha! It’s been so so great and I’ve caught up in the garden in so many ways but Gardener Bloggers Bloom Day escaped me. I just planted some Siberian Iris that’s been waiting patiently for me all Summer and admired her rusty foliage! My she looks stunning next to that blood grass. All I have left blooming is Calendula, Johnny Jump Ups and one tiny Borage I also noticed yesterday. Even the foliage is gone with the strong winds we had except for Panicum which is now a deep gold – yep, still a Pan fan! I love your “Mediterranean Path!” Bet it smells even better than it looks. An excellent showing for November. Thanks for joining in! Nice choice of off season plants. Two of my favorites even in the summer is lamium, something about the foliage I find so striking. It’s not just the colors but the texture is a little different also. The other one I love is the blood grass.Thanks for sharing these spectacular plants. I am glad your garden, and the gardening weather, is hanging in there for you!